More money is spent on non-prescription cough and cold drugs than the defense budgets of most countries. Worse, many colds, also known as URI’s (upper respiratory infections) are treated with antibiotics. Yet there is hardly a valid study which has found these treatments to be anything but worthless in children. Like so many pediatric ailments, much of the treatment is based upon folklore and medical myths, very few remedies based upon sound scientific information. Where in the world did you hear? Better take something for that cold. You don’t want it to become bronchitis or pneumonia. All colds are caused by viruses: rhinovirus, coronavirus, adenovirus, respiratory syncytial virus, influenza virus and others. Viruses, we know, are unaffected by antibiotics. Therefore, treating a cold with an antibiotic is not only useless, it can result in the emergence of resistant bacteria, a harmful side effect. Not to mention other problems: diarrhea, allergic reactions and yeast infections. Why would anyone want to subject his or her child to this kind of misery? What if the cold becomes something worse: bronchitis, pneumonia or an ear infection? Although more than 95% of common colds come and go without the development of a secondary infection, parents know that children with a history of wheezing or ear infections need special watching. But treating with antibiotics in anticipation of such complications is not a good idea. Infections that develop after antibiotics have been taken are often more severe, the germs resistant to many antibiotics. These risks are too great. The best defense is to keep mucus secretions as liquid as possible by using saline nasal spray or drops and by quickly initiating treatment for wheezing if the child develops a persistent cough. 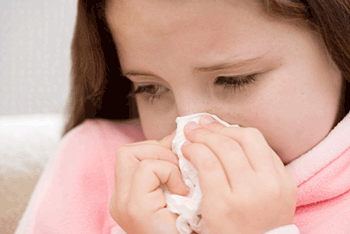 The common cold is an infection caused by a virus and never requires treatment with antibiotics. Since some children develop secondary illnesses such as wheezing or ear infections, it’s a good idea to check with the doctor if the child’s symptoms seem to change or worsen. You should get one of those over-the-counter cold remedies to relieve your child’s symptoms. Save your money. Most cold “remedies” are worthless in children. Virtually every cold medicine contains the same two ingredients: an antihistamine and a decongestant, neither of which addresses the basic causes of cold symptoms. Mucus, congestion, fever and cough are caused, in large part, by cytokines and leukotrienes, inflammatory proteins produced by the body in response to infection, not histamine. And yet, almost every popular over-the-counter medicine contains antihistamines, drugs appropriate for treatment of allergies, not colds. Most studies in children show these medications are useless and, worse, they often produce side effects of irritability and whining. Parents can be misled into thinking the child’s illness is getting worse, not realizing that the treatment itself is responsible for the misery. They can only hope that their fussy children will, at least, become sleepy from the antihistamine. But often, just the opposite occurs: the kids become “wired” and won’t sleep at all. And decongestants, the other ingredient in cold medicines, whether combined with antihistamines or packaged separately are troubling as well, capable of causing sweating, restlessness, elevated blood pressure and cardiac excitation with minimal or no relief of cold symptoms, another poor choice. You might then ask if over the counter cough medicines have a better track record. Sony you asked, because the answer is no. Most cough medicines that advertise relief from day coughs, night coughs, mucusy coughs, fever, headache and achy muscles are equally ineffective. Studies in children fail to show any significant shortening of cough symptoms compared with cough drops and increased fluid consumption. The reason is that the main ingredients in most over-the-counter cough medicines are the same as in the cold remedies except for the addition of “expectorants,” compounds to help thin the mucus. They don’t. And why combine these ineffective cold or cough medicines with acetaminophen or ibuprofen? It doesn’t make therapeutic sense but lots of manufacturers do just that. In the absence of fever or pain, those drugs are inappropriate and, in some cases, can interfere with the body’s production of antibodies, thereby prolonging the illness. Not to mention that by combining medications, it is difficult if not impossible to administer the correct dose of each individual medicine. So, are we left with nothing? Isn’t any treatment available to relieve the symptoms of the common cold? The answer is yes, it’s simple and inexpensive: nasal saline, a solution of salt and water. This remedy is remarkably effective in liquefying nasal mucus and helping to alleviate the post- nasal drip cough that accompanies most colds. Spraying or dropping saline into the nose several times a day and, especially, before going to sleep helps to move mucus out of the nose without side effects. It works and it can be made at home. How? Add 1/4 teaspoon to 8 ounces of tap water, boil and cool. That’s it. Newer medications are becoming available and may soon be used in the treatment of the common cold. One of the most promising is a medication called montelukast, an oral medication that blocks leukotriene, an inflammatory protein which increases congestion. More specific anti-inflammatory medications are surely on the way as are vaccines to immunize against many of the viruses which cause the common cold.